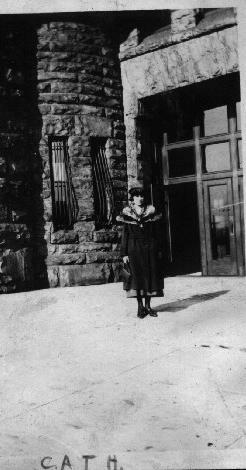 Katherine Frances Patz in front of 267 Colorado Street, Buffalo, NY. (No date). Katherine Frances Patz was born on April 4, 1897, in Buffalo, NY. She was baptized on April 18, 1897, by Fr. Ferdinand Kolb of Saint Boniface R.C. Church, 124 Locust Street, Buffalo. Her godparents were August and Frances (née Schwertfeger/Schwert) Schlia/Schlee. Katherine's daughter, Mary Ann, is not sure how far her mother went in school. 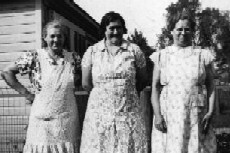 Mary Ann believes that Katherine worked in a textile mill for a while with her sister Mary. 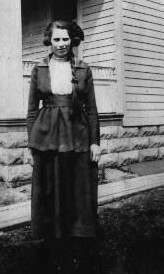 In the 1915 to 1928 Buffalo city directories, Katherine is listed as having various job titles such as: silk winder, laundress, cutter, machine operator, clerk, helper, knitter. Katherine apparently was married twice. The baptismal record at Saint Boniface Church includes an annotation that Katherine married an Andrew Gorman on February 24, 1925; we have no further information as to that marriage. 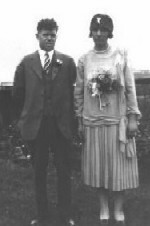 Katherine then met and married George Eberle, whose first wife Ottilia (née Schill) Eberle had died in 1925. Katherine and George resided at 228 Esser Avenue. 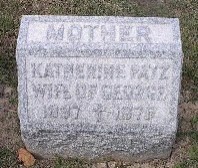 There, Katherine's mother Mary (née Schwertfeger/Schwert) Patz lived with them and Katherine and George's two children: Mary Ann and George ("Buddy"). 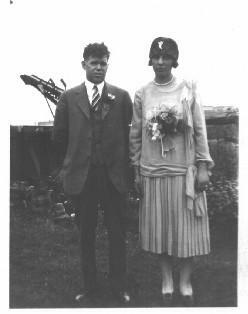 George and Katherine Frances (née Patz) Eberle on their wedding day. The time element is not known, but after George died it seems that Mary Ann won a house on Oregon Street through a church raffle. The four of them moved into it. 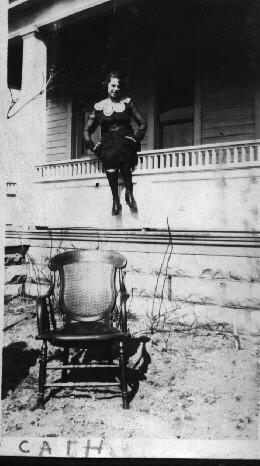 While residing there, Katherine worked at the "Emergency Hospital" on Grider Street until after Mary Ann was married. Katherine had foot and ulcers on her ankle problems. It was extremely painful for her to walk and go to work. 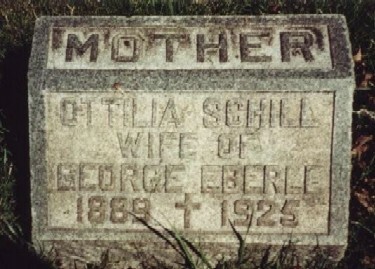 George had first been married to Ottilia Schill, who died in 1925. George and Ottilia had two sons, Jerome and James, who were around 11 or 12 years old at the time. James eventually moved away from the city. Jerome stayed, and he and his wife Tilly (Ottilia née Calkins) were very helpful and caring toward Katherine and her children throughout their lives. George had his own business of repairing car radiators somewhere around Hertel Avenue in Buffalo. On November 18, 1944, while arriving at work, George half fell out of his car because of a stroke or heart attack and died. Katherine later resided with her daughter Mary Ann in Louisiana. Katherine died on January 2, 1975, in Alexandria, Louisiana. She and George are interred in the Eberle Plot, Lot 58, Sec. 7½, United German & French Cemetery (Pine Hill), Cheektowaga, NY. 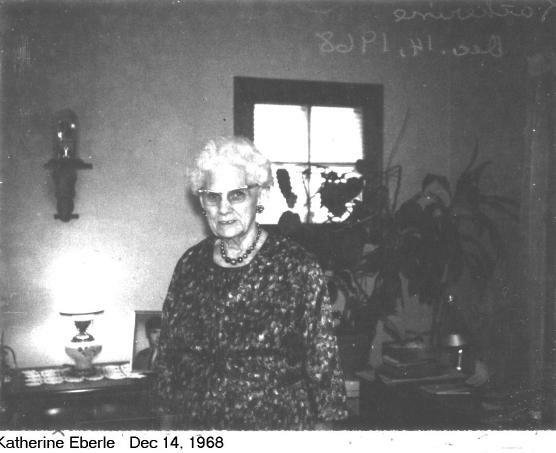 Based primarily on the memories of Mary Ann (née Eberle) Gillespie, daughter of Katherine (née Patz) and George Eberle. 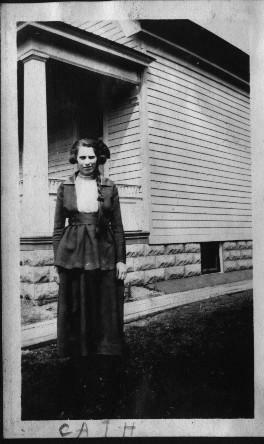 Katherine Frances Patz, posing on porch of 267 Colorado Street, Buffalo, NY. (Date unknown). Katherine Frances Patz, with her brother Bernard George Patz. (Date unknown). Katherine Frances Patz in front of the Best Street Armory, Buffalo, NY. (Date unknown). 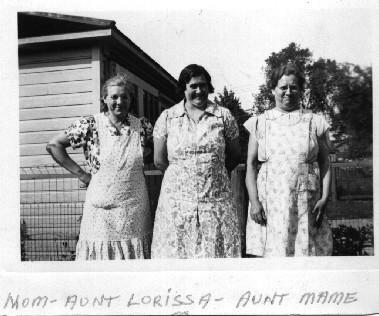 Katherine Frances (née Patz) Eberle, Lorissa (née Lander) Patz, and Mary Rosalia (née Patz) Sahr, on date of Mary Ann Eberle's confirmation, 1938 or 1939. Katherine Frances Patz, December 14, 1968. 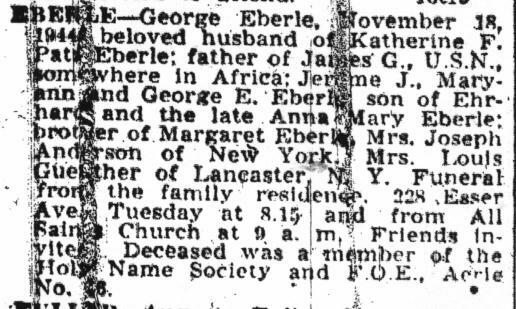 George Eberle: Born 1929; died 1929. 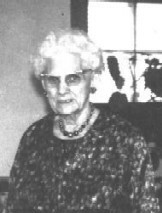 Mary Ann (née Eberle) Gillespie: Living. 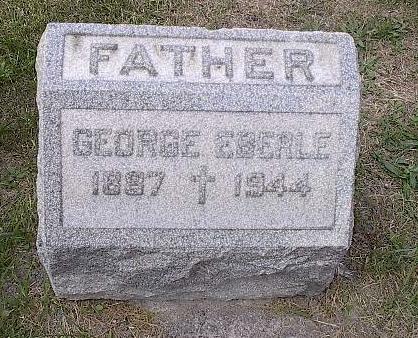 George Eberle: Born 1933; died 1933. George E. ("Buddy") Eberle: Born 1936; died 1970. 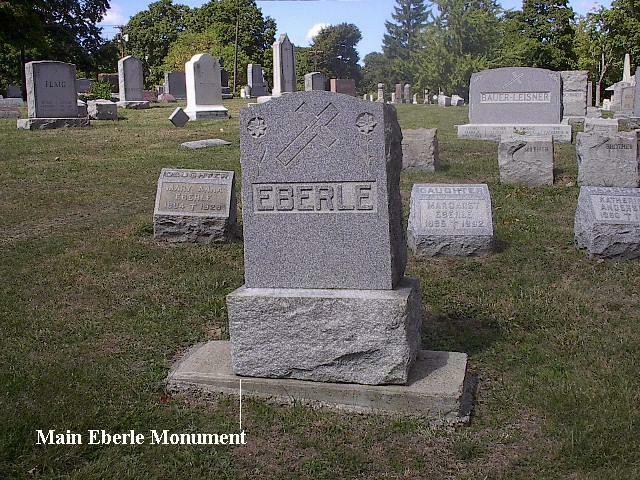 Eberle family gravesite, Lot 58, Sec. 7½, United German & French Cemetery (Pine Hill), Cheektowaga, NY. 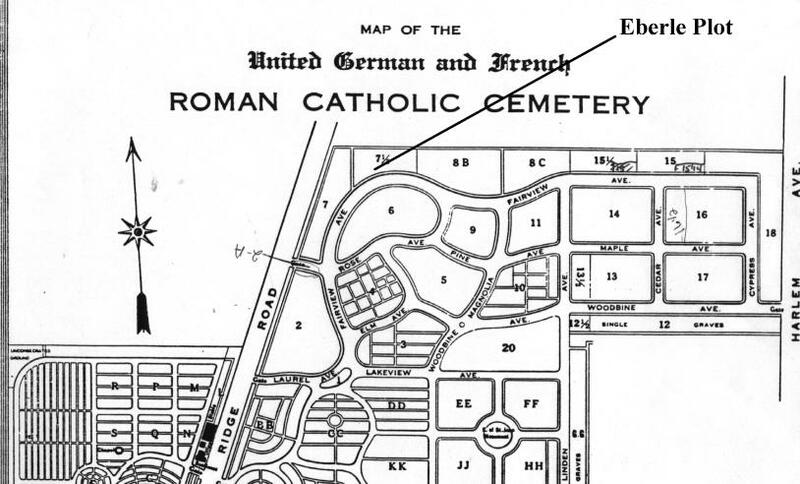 A map to locate the gravesite is here. 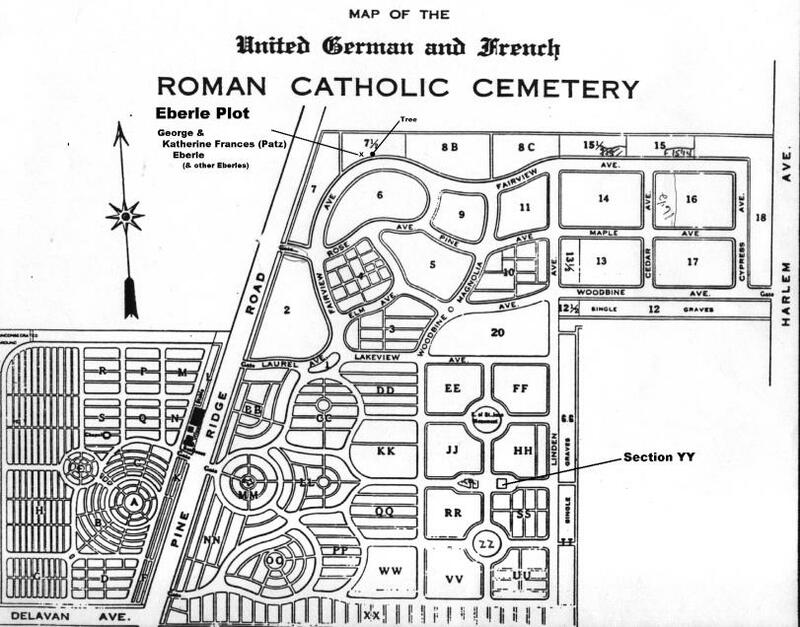 Plot maps of the gravesite are available here and here. 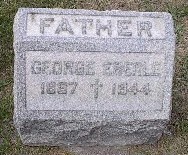 Grave of George Eberle, Eberle family gravesite, Lot 58, Sec. 7½, United German & French Cemetery (Pine Hill), Cheektowaga, NY. Grave of Katherine Frances (née Patz) Eberle, Eberle family gravesite, Lot 58, Sec. 7½, United German & French Cemetery (Pine Hill), Cheektowaga, NY. 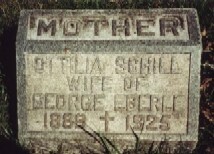 Grave of Ottilia (née Schill) Eberle, first wife of George Eberle. 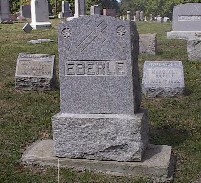 Eberle family gravesite, Lot 58, Sec. 7½, United German & French Cemetery (Pine Hill), Cheektowaga, NY. Baptismal Record: Katherine Frances Patz, born on April 4, 1897. Baptized by Fr. Ferdinand Kolb of Saint Boniface R.C. Church, 124 Locust Street, Buffalo, NY, on April 18, 1897. 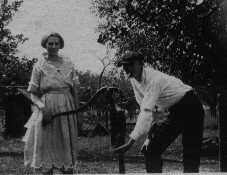 Sponsors were August and Frances (née Schwert) Schlia (= Schlee). Census Records: 1900 U.S. Census records for Erhardt and Anna (née ???) 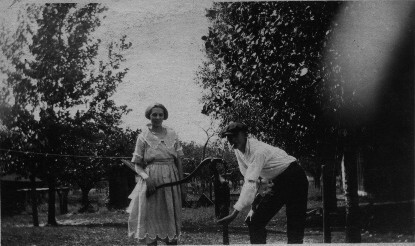 Eberle, parents of George Eberle. Obituary: George Eberle, died November 18, 1944. 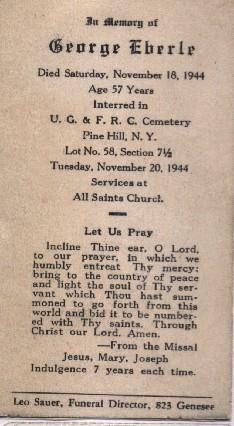 Funeral Mass Card: George Eberle, died November 18, 1944, funeral service on November 20, 1944. 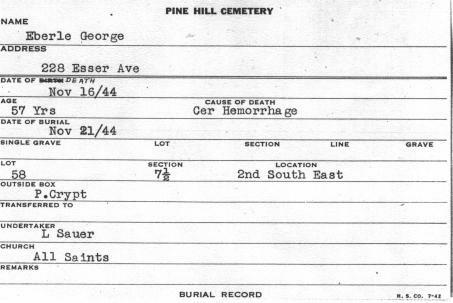 Interment Record: George Eberle, died November 18, 1944 (the November 16 date on this card is apparently a typo). 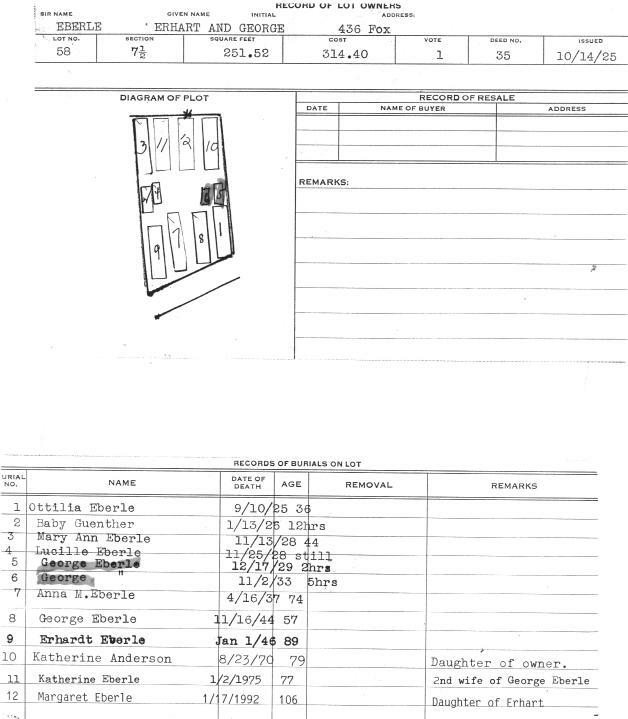 Interred in Lot 58, Sec. 7½, United German & French Cemetery (Pine Hill), Cheektowaga, NY. 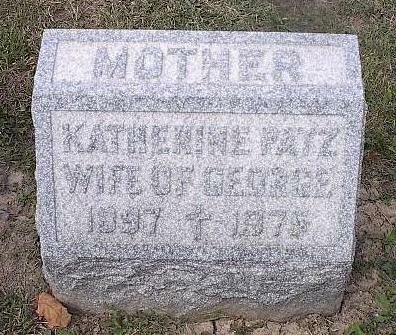 Obituary: Katherine (née Patz) Eberle, died January 2, 1975. 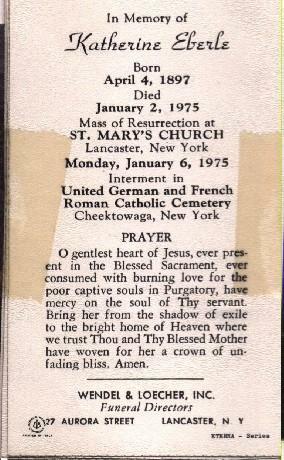 Funeral Mass Card: Katherine (née Patz) Eberle, died January 2, 1975, funeral service on January 6, 1975. 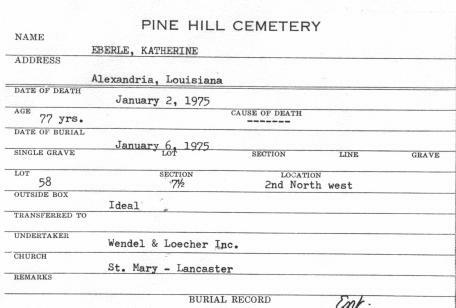 Interment Record: Katherine (née Patz) Eberle, died January 2, 1975. Interred in Lot 58, Sec. 7½, United German & French Cemetery (Pine Hill), Cheektowaga, NY. Map to Gravesites: Eberle family plot, Lot 58, Sec. 7½, United German & French Cemetery (Pine Hill), Cheektowaga, NY. Cemetery Plot Map: Eberle family plot, Lot 58, Sec. 7½, United German & French Cemetery (Pine Hill), Cheektowaga, NY. Cemetery Plot Map: Eberle family plot, Lot 58, Sec. 7½, United German & French Cemetery (Pine Hill), Cheektowaga, NY. 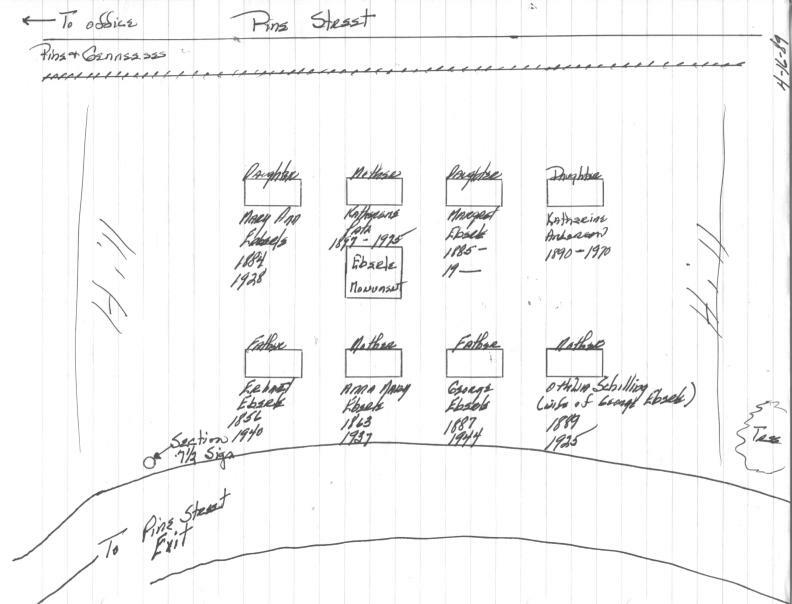 Hand-sketched map of gravesite positions by Bernard Patz. 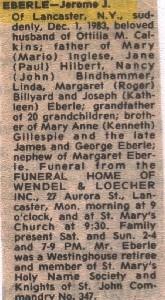 Obituary: Jerome J. Eberle, son of George and Ottilia (Tilly) (née Calkins) Eberle, died December 1, 1983. 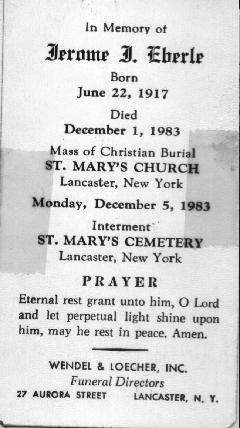 Funeral Mass Card: Jerome J. Eberle, son of George and Ottilia (Tilly) (née Calkins) Eberle, born on June 22, 1917, died on December 1, 1983. Interred at Saint Mary's Cemetery, Lancaster, NY.